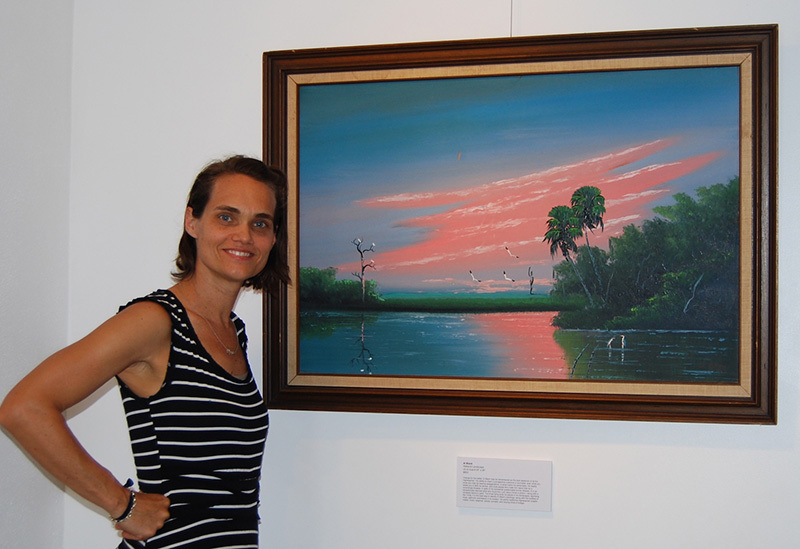 Palmetto Art Center founder and director Gretchen Leclezio stands with one of the Florida Highwaymen paintings that was on display from the Sunshine State of Mind show in the gallery before the CONSTRUCT exhibition that opens Oct. 6. The painting is one of a lot Leclezio obtained and now has for sale. 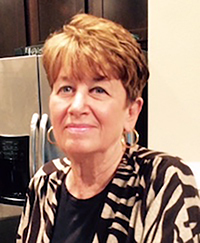 Artist Carol Hill, a part-time Palmetto resident, was intrigued when she was asked to do a painting for the new show at the Palmetto Art Center. “The theme of the show is a very different idea for an exhibit, but very creative,” said Hill, who splits her time with one daughter in Palmetto and another in Utah. “We’re hoping to draw a good crowd from the community,” she said. There will be an opening reception from 6 to 9 p.m., Friday, Oct. 6, for CONSTRUCT, a traveling art exhibit, at the Palmetto Art Center, 907 Fifth St. W., Palmetto. The show runs through Oct. 28. 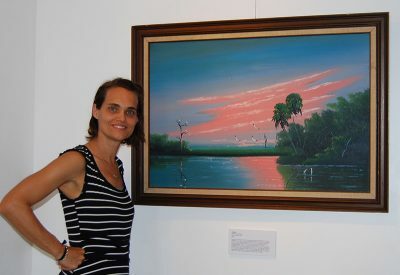 The show not only is unique because it moves to different locations throughout Florida, but it also introduces local artists to the exhibition while presenting the works of the core artists. 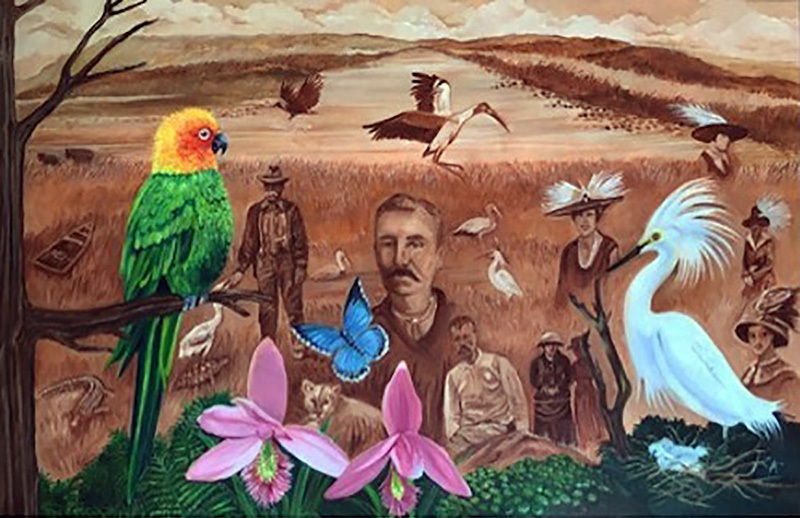 The painting by Palmetto artist Carol Hill hanging in the CONSTRUCT art exhibit at the Palmetto Art Center reflects the early 20th century history of the plume industry in Florida. He conceived of the idea when he was invited last spring to curate a show for the Gallary AIA in Ybor City. The Tampa Bay chapter of the American Institute of Architects had just moved into its new headquarters in the historic district and wanted to hold an art show on architecture, Beard said. “Gallery director Juan (Ricardes) asked me to organize an exhibition about architecture and I started thinking about building and architecture in a broader way,” Beard said. This definition of “building” opened up the exhibition to artists who use different mediums because it is so broad, he said. Beard has a bachelor of arts in painting from Colorado State University, and serves as curatorial assistant at the Dunedin Fine Art Center and as preparator for Scarfone/Hartley Gallery, University of Tampa. His work was featured at the Tampa Museum of Art as part of the SKYWAY: A Contemporary Collaboration show. When Hill was asked to display a work in the Palmetto exhibition, she drew on her love for nature. The painting depicts several people who fought against the plume industry of the early 1900s, which led to the extinction of bird species and endangering others species for the sake of women’s hat fashions. “The building of the state and all the traumatic things done to nature is all part of Florida history,” Hill said. Beard said Hill’s contribution to the CONSTRUCT exhibition was distinct. “Carol’s piece on the plume trade in Florida fits the show’s theme of CONSTRUCT well,” he said. “It demonstrates that for building forward we have to look at what we did in the past. For example, destroying rookeries. Hill graduated from San Diego State University with a degree in graphic communications and attended the University of California at Davis where she studied under Wayne Thiebaud, whose work is associated with the pop art movement. She also attended San Francisco Art Institute in the late 1960s and early 1970s. Hill said she always liked to draw as a little girl. “I eventually got some scholarships for art school and kept going,” she said. “I studied fine arts, but did illustration after graduating to make a living,” said Hill who has designed a series of CD pograms for children and adults, where they can print out pictures to color and arrange them into a final piece of art. Hill came to Palmetto when her daughter moved here in 2000. “I love Palmetto,” she said. “Where my daughter lives I can sit on the back porch, which overlooks the water, and paint nature. “It’s very conducive to creativity,” Hill said. 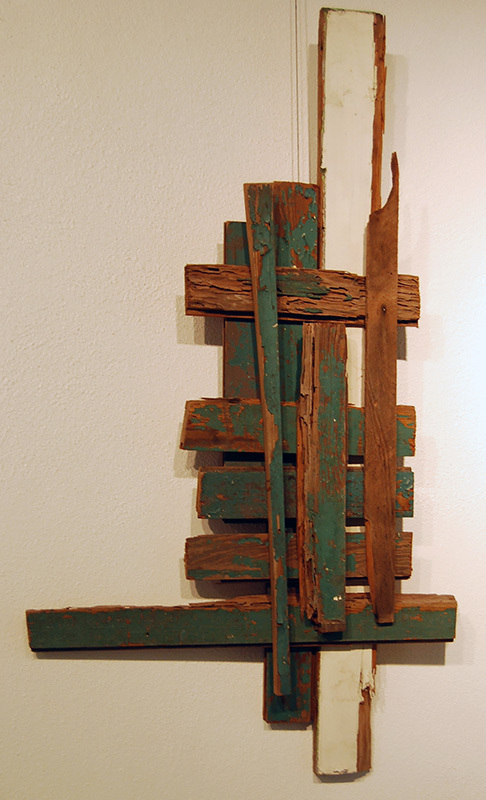 A sculptural piece by St. Petersburg artist Nin McQuillen hangs on a wall at the Palmetto Art Center in preparation for the CONSTRUCT art exhibit. McQuillen has been an artist in the Tampa Bay area for 40 years and has his work on display at the Leslie Curran Gallery on Central Avenue in St. Petersburg. Being an artist, Hill said she was looking for the art scene in the area when she settled in and someone told her about the Palmetto Art Center. She met with Gretchen Leclezio, the founder and director of Palmetto Art Center and “she wanted to exhibit my paintings,” Hill said. I was very impressed by what they do for the local community,” she said. The art center is the third venue for the CONSTRUCT exhibition. The first exhibition was at the Gallery AIA in the spring, and the show was at the USF Centre Gallery in the summer. “This adds to the CONSTRUCT concept,” Beard said, “because you have to see how each piece works in the different space. “In one show, two pieces may hang next to each other, but they may not work well together in another space,” he said. Also, he said, the other activities that are held at the Palmetto Art Center limits the kind of pieces that can be displayed. Leclezio said she appreciated the flexibility of the show and how Beard accommodates her need to provide the other activities for the community. The art center offers a variety of scheduled classes, including homeschool art, open-studio clay, painting, and even wellness programs, such as yoga and Pilates workshops. Leclezio said when she was approached about being a venue for CONSTRUCT she was eager to play a part of the project. Beard and Leclezio have a mutual artist friend, Lane Nixon, who mentioned to Beard that the Palmetto Art Center would be a good venue for his CONSTRUCT exhibition. She said with the show being a traveling exhibition it was beneficial for local artists. “CONSTRUCT promotes the connection of the work of professional artists from different areas to an audience that they may not have previously reached,” Leclezio said. Artists whose work will be exhibited are Caitlin Albritton, Catherine Bergmann, Marianne Chapel, Robin Perry Dana, Janos Enyedi, Carol Hill, Bryce Hudson, Kenny Jensen, Jack King, John Kokajko, Nin McQuillen, Chad Mize, Laine Nixon, Joan Peters, Meg Pierce, Jan Richardson, Nathan Skiles and Christopher Wade. They come from Palmetto, Bradenton, Sarasota, Dunedin, St. Petersburg and Tampa. For information on the classes offered at the Palmetto Art Center visit the website www.palmettoartcenter.com. Examples of artwork by Hill can be seen at tinyurl.com/observer-construct.